To get in the mood for Iceland I reread Ævar Þór Benediktsson’s short story about the librarian who finds her library empty of books one morning. And who then drops her Moomin mug. She did go to the library, though. They had an exhibition of photographs on, which to her surprise they charged for. Must be in case more Moomin mugs drop. She got her zeroes a bit wrong, too, having recently exposed herself to the Chilean peso, where it was quite reasonable to pay 15,000 for lunch. (I think, anyway.) 1000 krona in the library, however, was more than expected. The day after Daughter’s arrival in Reykjavik, I noticed BBC Four had the new season of Icelandic noir Trapped on. I wasn’t entirely sure it was wise to watch the horrendous things that might happen in Iceland, but we did anyway. Seems the Resident IT Consultant had watched season one, while I hadn’t. I’d forgotten this. It’s grim. I suppose if the weather was sunny, the noir would kind of fail, so maybe the grey drizzly surroundings are to be expected. I find the people – the fictional characters – unlikeable. I went to school with that girl. Didn’t like her then. Don’t like her now. The men are all the same as those who sit on Swedish park benches with a carrier bag next to them. And don’t drink the water in the stream, whatever you do! The lit up town at night is pretty, though. And I almost understand some of what they say. I’m absolutely green with envy. This is the Aarhus 39 weekend (if that’s what it is when it begins on a Thursday), and I’m not there. Meg Rosoff is swanning around in the company of Eoin Colfer and Chris Riddell, two ex-children’s laureates. Two of my favourites. They, in turn, are swanning around in the company of Meg, favourite everything. I don’t see how it can get much worse. For me, that is. They and Aarhus are probably having a great time. They are probably swanning around with Daniel Hahn, assuming he’s in a position to swan with anyone. 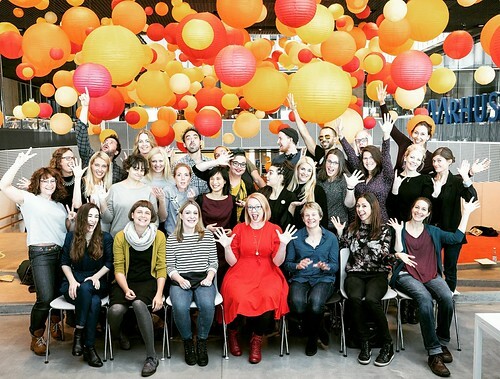 This Astrid Lindgren nominated whirlwind has gathered at least two more ALMA nominees – Maria Turtschaninoff and Ævar Þór Benediktsson – as well as most of the other 37 Aarhus 39ers. That’s them in the jolly photo below. No doubt they are mostly swanning too. And the lucky citizens of Aarhus will have been going round to all these book events, most of which appear to have been free. I hope this means that it might become a habit, and that maybe next year I can swan somewhere. Unless all the laureates are worn out by then. The very lovely, and kind, Ævar Þór Benediktsson, is very lovely. And kind. Just thought I’d mention that. He likes me. This is understandable, if unexpected. He read my recent blog post about Moomin mugs and about having too many or – as in my case, and the former case of Daniel Hahn’s – of owning just the one. So he emailed to ask how he could send me something. I told him. And it has arrived! The something being my second Moomin mug!!! And, it’s weird. I am a witch. We know that. But I didn’t know that Ævar is too. 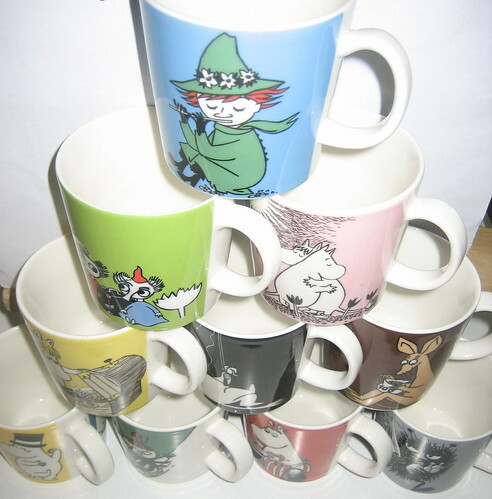 Because another thing about Moomin mugs is that you sort of know what your next one would be if you were to go shopping. 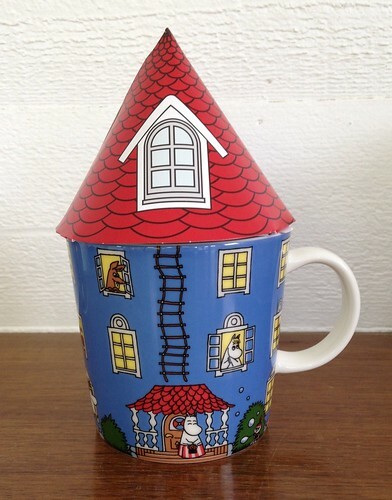 And that’s precisely the mug Ævar sent me… The Moomin house; the mug with a hat. Now, what else could I blog about that would make someone want to give me presents? Except this won’t work, because I do my witching for no reward. 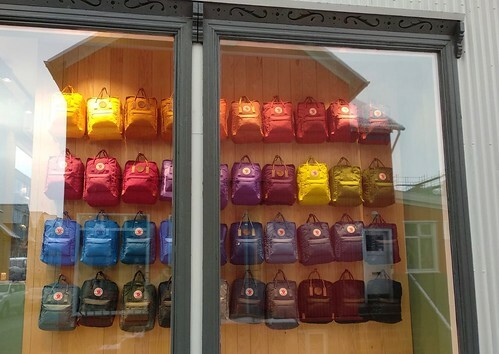 I can’t be bought. In this Moomin mugs instance I remained completely oblivious to even the possibility that an Icelandic author might suddenly be afflicted by a bout of generosity and send me such an exquisite gift. 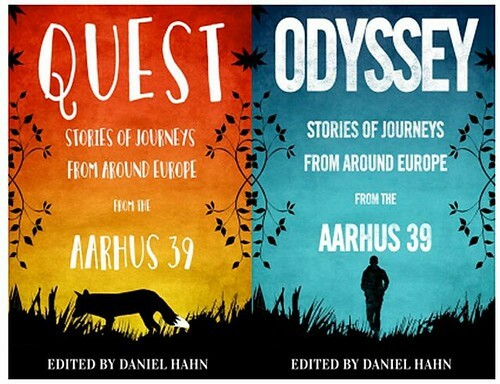 You will remember the Aarhus 39 story collections. Yes, you will. In the younger one there was a rather lovely story by Ævar Þór Benediktsson called The Great Book Escape, in which a dedicated librarian discovers that all the books in her library have disappeared. She reacts as any sensible librarian would do by dropping her favourite mug. It’s a Moomin mug. Obviously. Some pages later, after looking into this dreadful state of things, ‘she sighed deeply and took a gulp from a different Moomin mug (anyone who owns one Moomin mug owns at least three).’ And then she knew what to do. That statement about owning more than one Moomin mug, is so true. And yet not. But I only have one Moomin mug, so don’t fit the pattern of multiple Moomin possessions. I’m quite happy with the one, but now fear a situation such as our librarian experienced. I admitted this pitiful state of affairs to Daniel Hahn last month, as he is the editor of the Aarhus 39 collection. And actually, it seems that he was in an identical position until quite recently, and happened to mention this to Ævar, and was duly presented with a second mug when they met. Danny can now afford to drop one.